London has long had a reputation for being a gastronomic capital and the recent opening of Lurra has only served to add to the city’s tasty laurels. 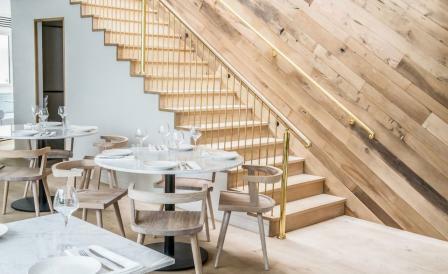 Named after the Basque word for ‘land’, Lurra is the sophomore effort of Melody Adams and Nemanja Borjanovic and, like its sister restaurant Donostia located along the same street in Marylebone, it carries the Basque flag high and proud. The house specialty is based on the charcoal and wood grill cooking commonly found in that part of Spain, all served up in a slick room of creamy white, marble tops, walls clad with wood from old wine barrels, and streaks of sunny brass. The relaxed richness of the interiors are courtesy of Adams herself and include, towards the back of the restaurant, a private al fresco courtyard and a chef’s herb garden. Headlining the kitchen is Donostia’s Damian Surowiec who, we’re told, will pull double shifts as he sends out perfectly charred slabs of Basque and Galician beef, cod tongues, whole baby red mullet and tiger prawns cooked in baskets, and even juicy ceps with egg yolk. Carnivores will, we think, thrill to the 14-year old Rubia Gallega ‘Galician Blond’ prime rib.